The ReaLemon 48 oz. 100% Lemon Juice is great for lemonade, add ins for sauces and for health and beauty. It is very inexpensive here on Webstaurant! The convenience of having lemon juice squeezed and in bottle fork saves so much time. It's great to add into your drinks or baked items that call for lemon juice. You can't go wrong with this brand. We love keeping the ReaLemon on hand for any recipe that needs a little zing. I find it's much easier to have this in the fridge than to make sure that I always have lemon on hand. Great taste, easy to use and store. Great price! ReaLemon juice is the best I have ever had. The juice is really great for making our lemon curd. The juice is so fresh and taste great. A must have for our household. Great product! Love keeping it in the fridge and adding it to my water, and any other dish that i would usually add lemon to. Convenient and easier than buying perishable lemons every time I need them! Great taste. If you need multiple jugs of ReaLemon then this is the buy for you. The eight count case is perfect for distributing the jugs to each bar you have located at your establishment. The juice is of top notch quality and the flavor is so fresh. We are long time fans of ReaLemon. love the lemon juice in the large bottle...perfect for all our cooking needs at the diner. better price then we have been able to find . If you work in the food industry and go through a lot of lemon juice this is more convenient to have stocked than real lemons and these bottles don't spoil near as fast. This lemon juice does not taste anything like real lemon. I suppose if you just needed acidity this would do the trick but it's got an odd odor to it that I'm not fond of. This lemon juice is great for cooking. I wouldn't substitute it in baking recipes where strong lemon flavor is desired because this juice is pretty mild. I just like it for the acidity. Overall this Lemon Juice is great quality, and a wonderful value. The scent and flavor is a little bit on the sweet side, however it does come off as natural and not candy like or similar to any cleaning products. (Which is fantastic, I was relieved once it arrived.) We simply no longer use it in our products, or else I would reorder. Would recommend for the quality and value. I use lemon juice in a lot of my foods and even sometimes to clean. Having such a large bottle that still has a easy pour spout is great. Fresh lemon juice. We use this to make lemon cupcakes. Very large bottle and sense it's such a large bottle it last a long time. This product is great for adding real lemon taste. It's also good within many recipes. It also is a necessary product when making vegan buttermilk for vegan recipes. This Lemon juice is Good in Flavor and some dishes call for Lemon in baking a must in my house to make Frozen drinks. I keep it on hand. love this real lemon juice. We are using this product for our restaurant for years. It is inexpensive compares to other products in the market. I use this for making lemonade. Great price through webstaurant's website. The flavor is fantastic and makes mixing up drinks easy. Also great for cooking and baking. WE just received our shipment of ReaLemon Juice this afternoon and already put it to test making a lemon cream cake. Its as authentic of a lemon juice taste as you will find and it is not extremely acidic. Real Lemon juice is so handy to have when you need lemon juice for quick dishes or flavoring! The bottle is large and can last a long time. I use it on fish, for and quick lemonade drinks. Great Juice. My family and I love lemon Juice. The bottles were bigger than I would buy in an ordinary super market. The price was bad either. Great buy. I will definitely purchase again. I couldn't make a better purchase locally. I love to buy fresh lemons all summer long to make lemon curd, add to smoothies, salad dressing, etc. but harder to find good price and lemons in the in winter so this is the next best thing. Real lemon, real thing! Great for cooking or cocktails. Use as a side with seafood and no one would know it wasn't fresh squeezed lemon. ReaLemon has a fresh lemon taste that works well in any recipe or beverage. We use it daily to make a wonderful Ice Tea! Also makes a great Italian Lemon Ice! This 48oz bottle contains as mush juice as 24 lemons. Where we live in the Midwest, lemons cost as much as a dollar each. This is a great value! Very inexpensive when compared to how many lemons it would take to get this much juice. I always keep this in my fridge at home for all cooking and drink making needs. Has a good shelf life too. Just need to shake very well as it separates a lot. 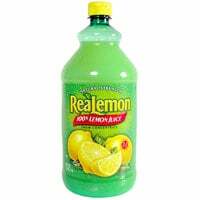 ReaLemon is a great product with pleasant fresh lemon tasting and an unbeatable price. Not just for lemonade, splashing a little to soy bean sauce makes an excellent dipping sauce. Realemon is a great way to get lemon flavor in all of your dishes without having to spend all the time and labor on juicing them. It really tastes like a whole lemon juiced. I really enjoy this product, it is a great quality and fresh tasting lemon juice for a great price. I use it mostly in sauces for a nice citrus kick. This stuff is awesome. You can't beat the price. On this site it's so much cheaper than juicing actual lemons! It works just as good too. This brand of lemon juice is great, it's very flavorful and bright and tastes almost like fresh lemons, we use it in our marinades to add a bit of zest. Great bargain! Can not beat the price! Excellent lemon juice for a multitude of applications in the kitchen! Takes the hassle out of juicing lemons!